Our first bees arrived at The Ranch in April. Their arrival meant that I could share another one of my passions with my colleagues and friends. With our long summer days, I know our honeybees will be very busy these coming months and will have a positive impact on The Ranch’s ecosystem. Our hope is that once these hives become established, guests will soon be enjoying the fruits of their labor. My personal experience with honeybees arose from my connection to the outdoors. 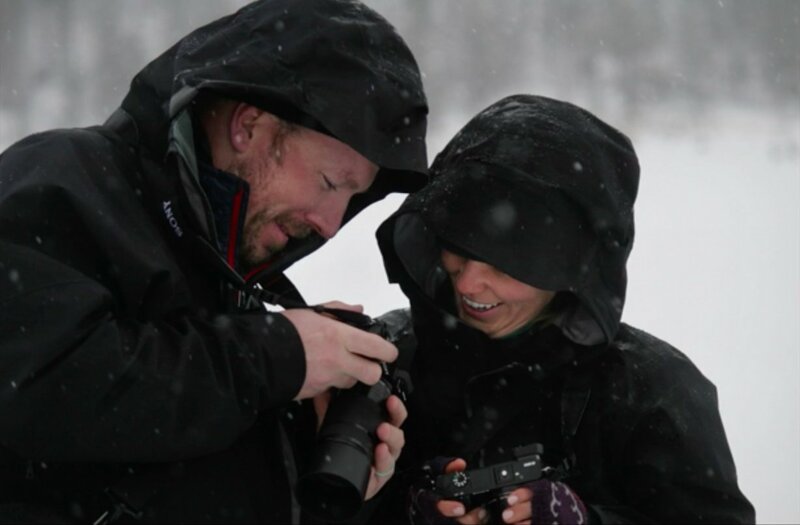 I have been working in conservation and outdoor education for 15 years, which led me to become the Little Grizzlies Kids Club program coordinator here at The Ranch. For me, part of preserving our natural environment for the health of native ecosystems and people is providing an environment for pollinators, especially honeybees. All the hives are now three tiers high. With long warm days, the nectar flow is on and the bees are collecting. Photo by Kelsey Bruns. I started an apiary in my backyard seven years ago. Beekeeping quickly moved from a weekend hobby to professional work as my obsession grew. During my years as a full-time apiarist, I helped manage 1,600 hives which produced and harvested honey, pollen, queen bees, bulk beeswax and even shipped bees overseas! 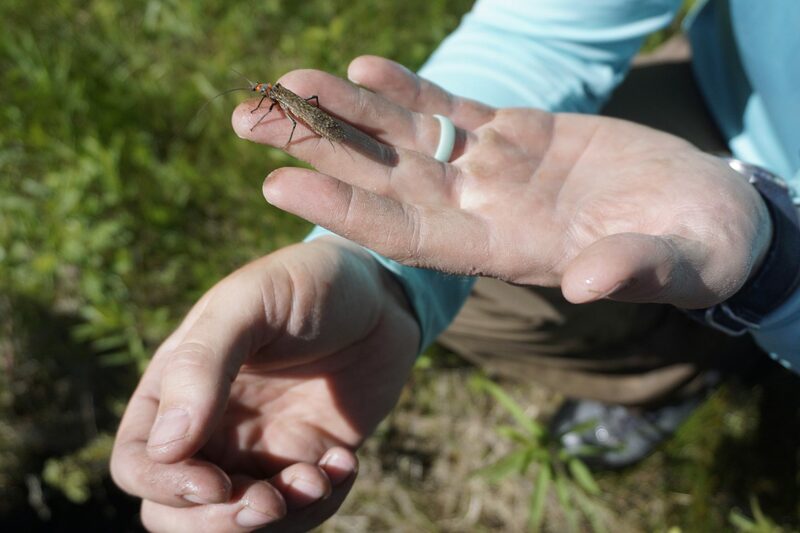 Kelsey visits the hives, located down Rock Creek, in a quiet valley location. Photo by Ben Johnson. 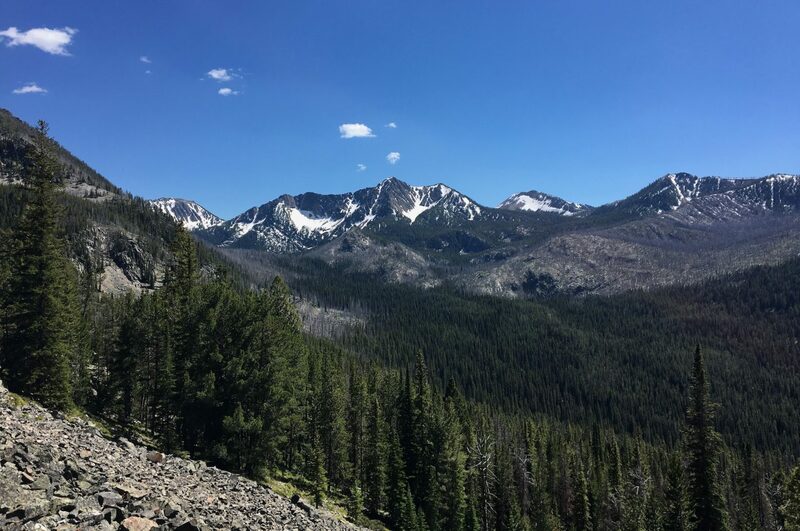 Though I have kept honeybees everywhere from New Zealand to the Midwest of North America and now Montana, the teachings of the honeybee are infinite and I will continually learn as the bees make their mark along Rock Creek. The honeybee is the connection to the plants around us and how those plants produce the food that is on our tables. Approximately one-third of the average diet is provided by the arduous work of honeybee pollination. Their work is accountable for billions of dollars of agriculture including strawberries, blueberries, pumpkins, almonds and zucchini. 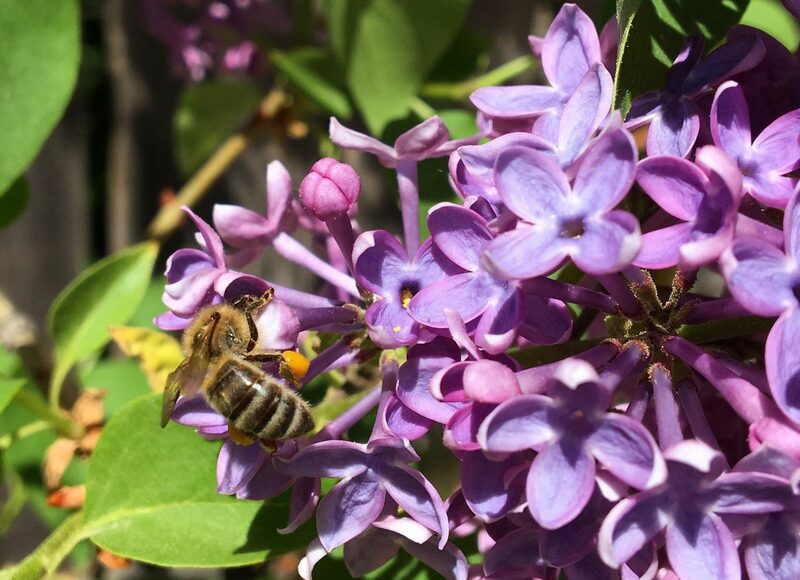 A honeybee collects pollen from a lilac bush. If you look closely you can see pollen on its body. Photo by Kelsey Bruns. In addition to providing much of our daily diet, many of the by-products of the honeybee hive are also very useful. The properties of pollen, wax, propolis and even bee venom have been commercialized in antibacterial, anti-fungal and superfood products that are consumed all over the world. Female worker bees keeping the brood warm on the frame. Photo by Kelsey Bruns. Many of our neighboring ranches also host commercial honeybee hives. 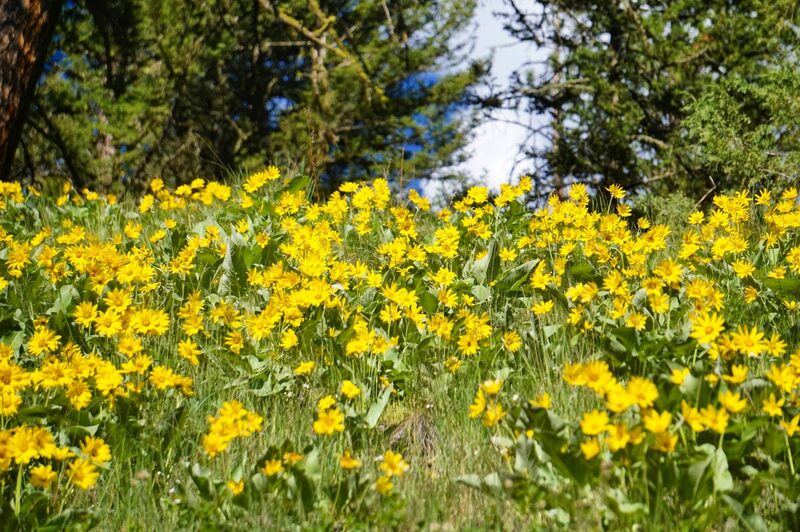 Montana’s Five-Valleys area is well known for producing delicious wildflower honey. The clover and alfalfa that honeybees pollinate are the food source of our local cattle, sheep and horses. The humble honeybee is an incredibly productive and efficient insect to which we are forever indebted. Though they are resilient, the future of the honeybee is not certain. 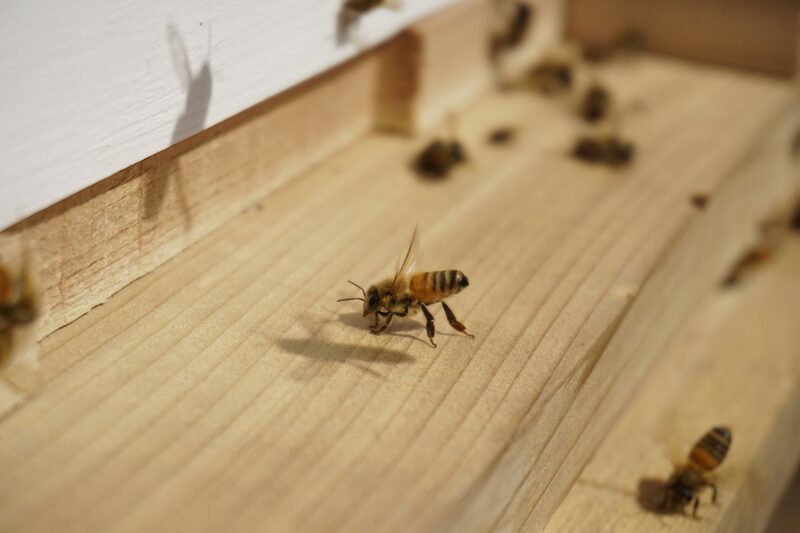 In recent years honeybees have been negatively affected by the increase use of pesticides, the spread of disease and segmented habitats due to commercial monoculture and urbanization. 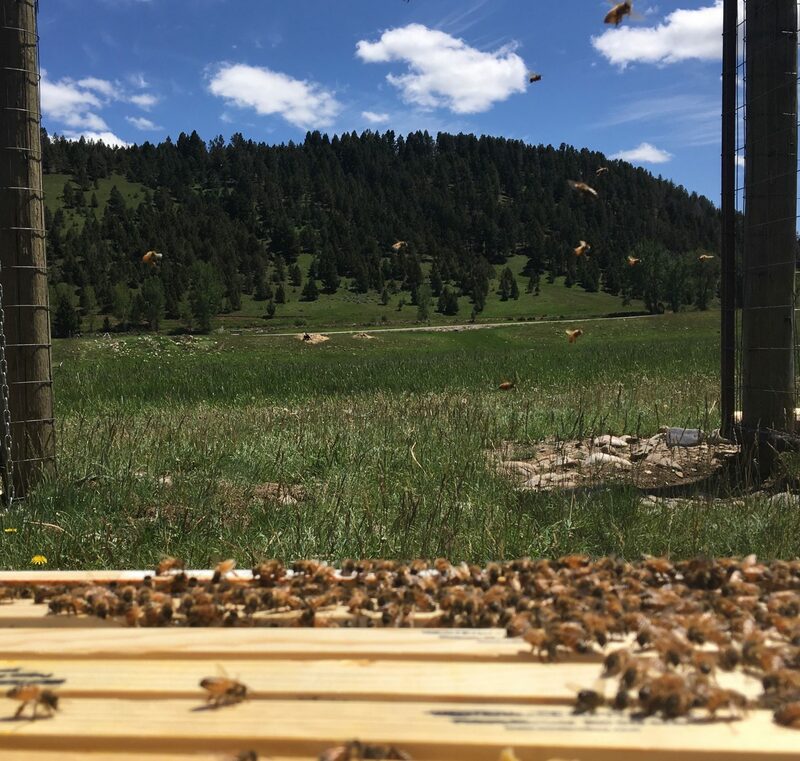 Creating an apiary here at The Ranch at Rock Creek is a huge opportunity for us to share a piece of Western culture with our guests and to also give back to our native Montana environment and the global honeybee population. 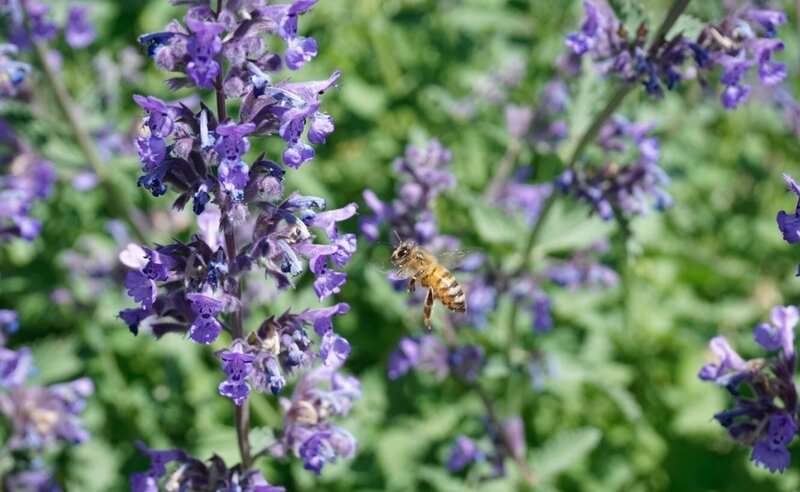 As a reward of our efforts, guests will be able to enjoy watching the honeybees forage on native flowers during their hikes, and soon, we can’t wait for them to taste honey that’s about as local as you can get. 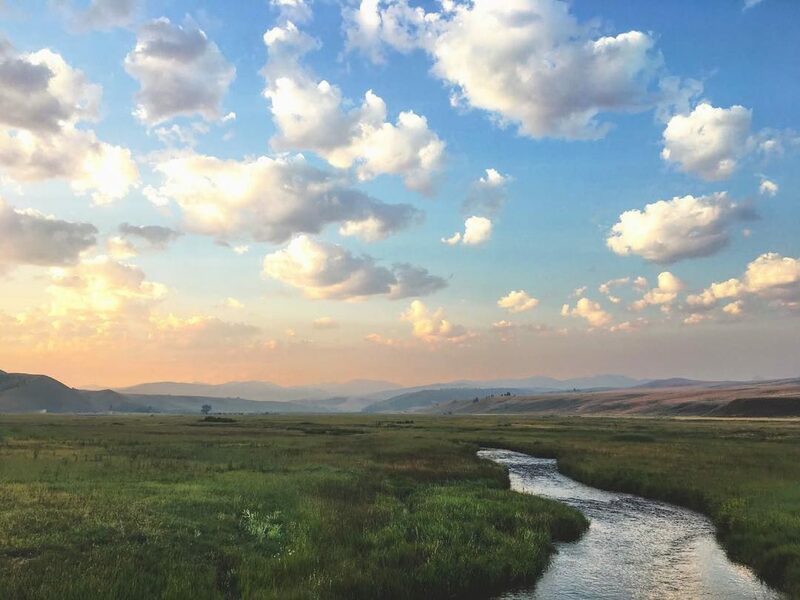 Montana summers come in fast and strong. The long days encourage the bees to forage on the local chokecherry and golden currents along the creek. The nectar of these flowers will be flown back to the hive to be stored for what is destined to be a long Montana winter. 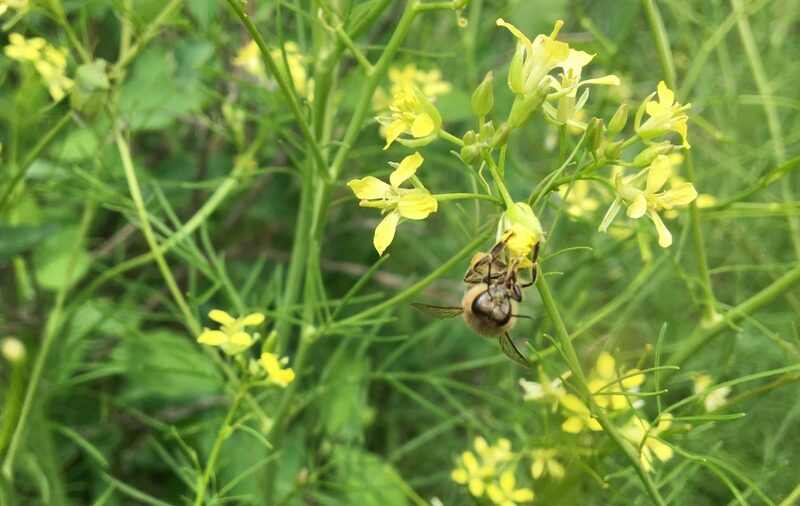 A bee gathers nectar from a mustard plant. Photo by Kelsey Bruns. I will update you as our five-hive apiary matures and becomes an integral part of our Ranch environment. Montana summers are glorious. For me, this time of year is defined by when the sunrise beckons you to get out and enjoy the long lighted days of the Northern Rocky Mountains. When that sun rises over the Rock Creek Valley, the bees also awaken and instinctively know it’s time to get out and collect nectar. The sun rises in the Rock Creek Valley. Photo by Rancher Lindsay Roberts. In June and July, the nectar flow has been strong. Rain in the evenings combined with warm summer days allows flowering plants to produce nectar. Without moisture or warmth, plants may flower but will not produce nectar. Lucky for us, Montana summer has treated us well and the bees have been collecting. A worker bee enjoys flying local on Ranch property. Our landscaped areas also provide opportunities to gather nectar and pollen. Photo by Kelsey Bruns. 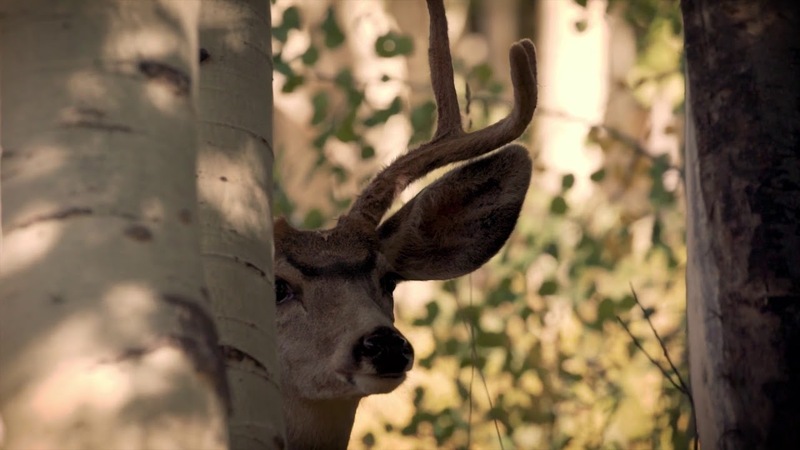 For Montana, honey is a multi-million dollar industry. 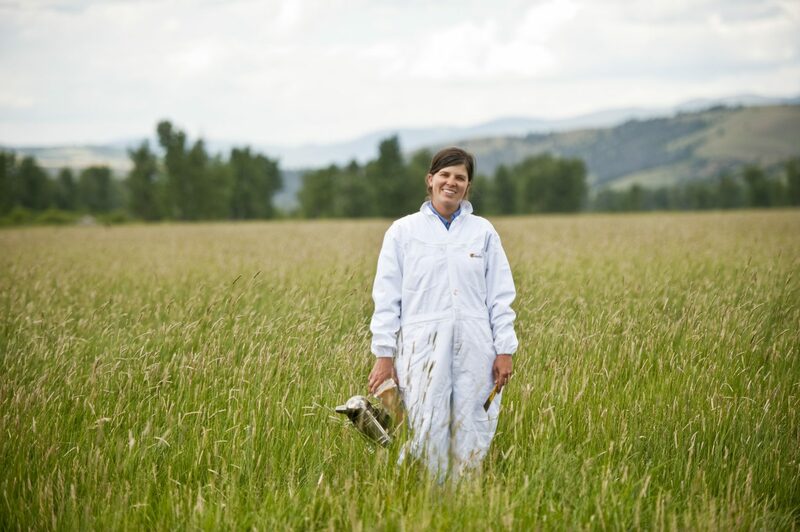 According to the Department of Agriculture, Montana is the second largest producer of honey in the United States. In 2013 our Treasure State alone brought in 15 million lbs. of honey! The hives are full and the bees are busy. A typical hive in the summer can have up to 80,000 bees! Photo by Kelsey Bruns. 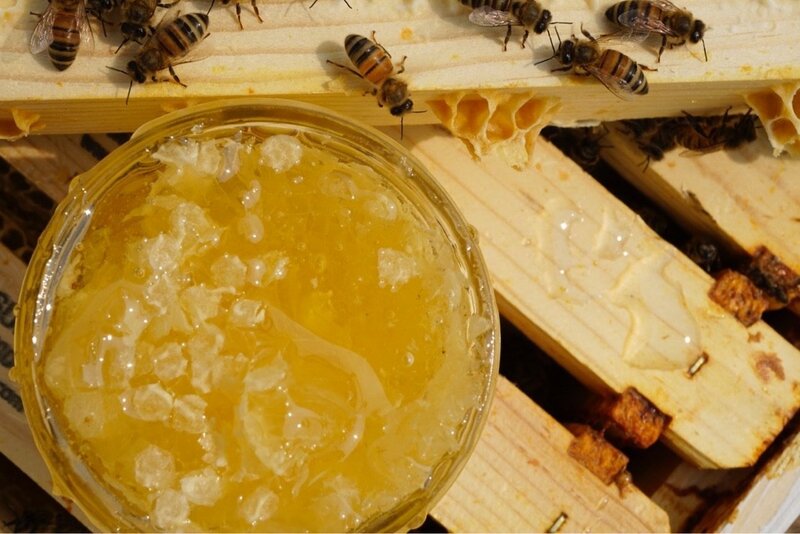 The process of making honey begins when the bees ingest nectar on a foraging flight. It is not uncommon for foraging bees to fly up to three miles to find nectar, but the real work in processing nectar starts at the hive. 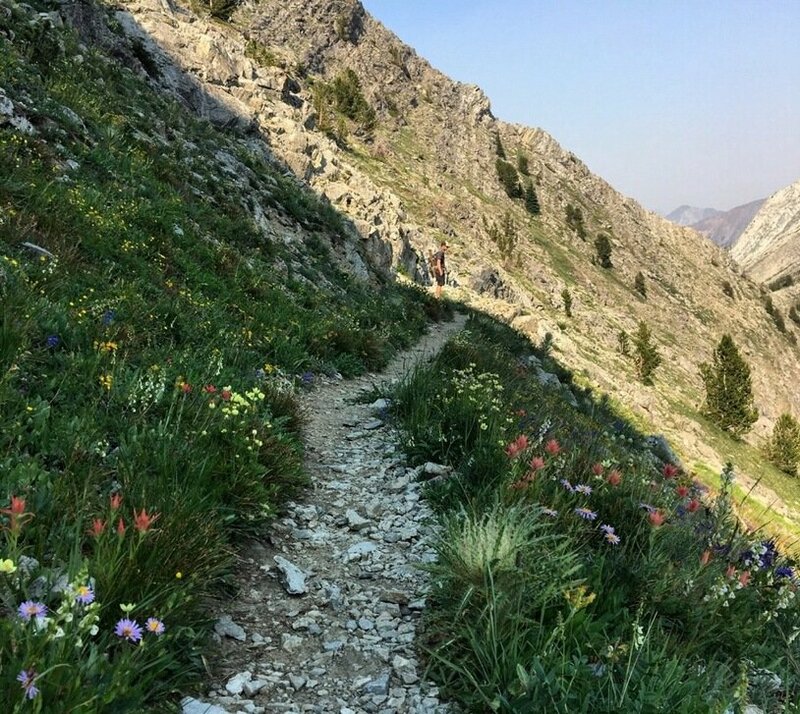 Wildflowers galore in the Anaconda-Pintler Wilderness. Bees fly up to three miles to enjoy the beautiful array of wildflowers along with us hikers. Photo by Kelsey Bruns. Once in the hive, female worker bees pass the nectar mouth-to-mouth. This process is a way to dehydrate the nectar to decrease moisture content. Nectar only becomes honey once the moisture content is below 20%. Once this is achieved the honey is capped with honeycomb wax, and then it is used to feed baby bees (larvae) or it is saved for winter food stores. Worker bees attend to the frames of honey by passing nectar mouth to mouth to dehydrate the nectar into honey before it is capped with wax. Photo by Kelsey Bruns. At the moment our hives on Rock Creek have produced one full box of honey, which will in turn yield about 60 lbs. of honey per box once extracted. From the recent nectar flow, much of the honey in the hive now consists of a lovely blend of white clover and a few wildflowers. If we get more rainfall in the next month, there will be another round of nectar flow before the days become shorter and cooler. In that case, I will likely have a bumper crop of honey. You don’t get more fresh and local than this! The first taste of our honey resembles a balanced mix of white clover and local wildflowers. Photo by Kelsey Bruns. As a lover of honey, I can never resist tasting honey as I work a hive. A single honeybee produces less than a teaspoon of honey in its lifetime, knowing this makes honey taste even sweeter. Chapter 3, Fall: Autumn Harvest is Here! 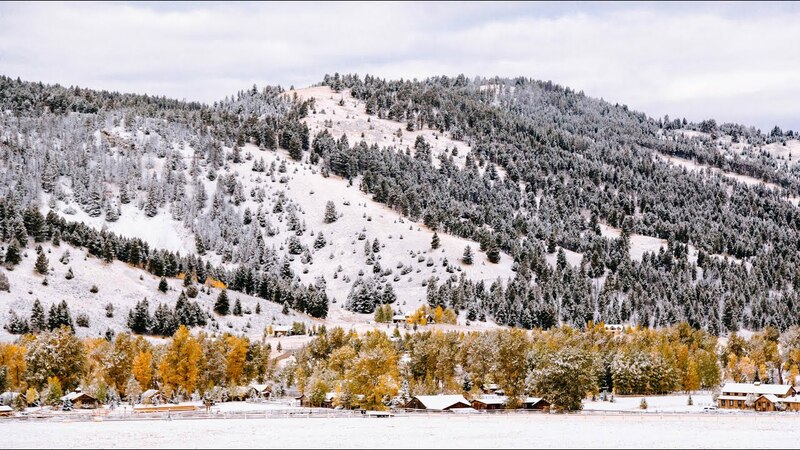 It’s autumn in Montana and change is inevitable. We are all preparing for winter. Here at the Rod and Gun Club our hiking boots are soon to be traded in for cross country skis and snowshoes. 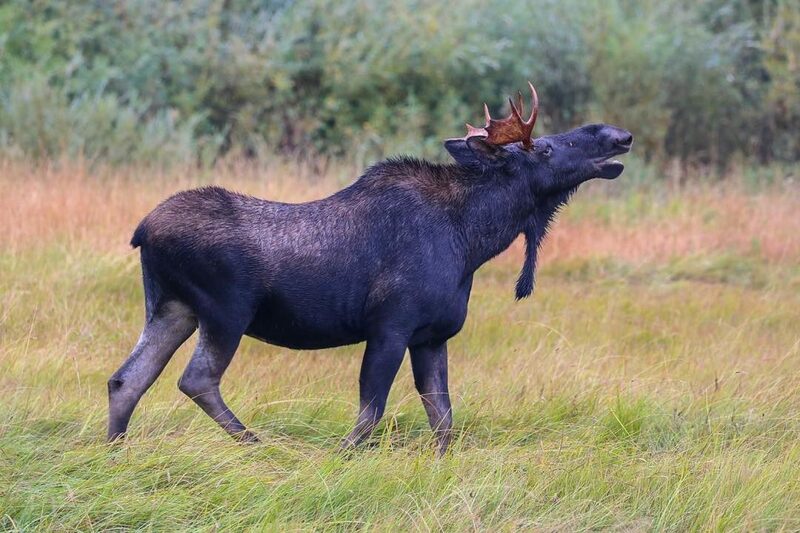 Photo of a Rock Creek Moose by Housekeeping Manager Zach Jones. The local megafauna are on the move. Once again a mama and baby moose are back on Ranch property to seek shelter and feed from Rock Creek. The honeybees have also been preparing for winter. I recently harvested our first honey crop, and soon the hives will be prepped for winter. We love harvest time at The Ranch, and even host a yearly celebration taking place this weekend, called Autumn Harvest Weekend. For the apiarist, it is a time to collect over a year’s worth of hard work. 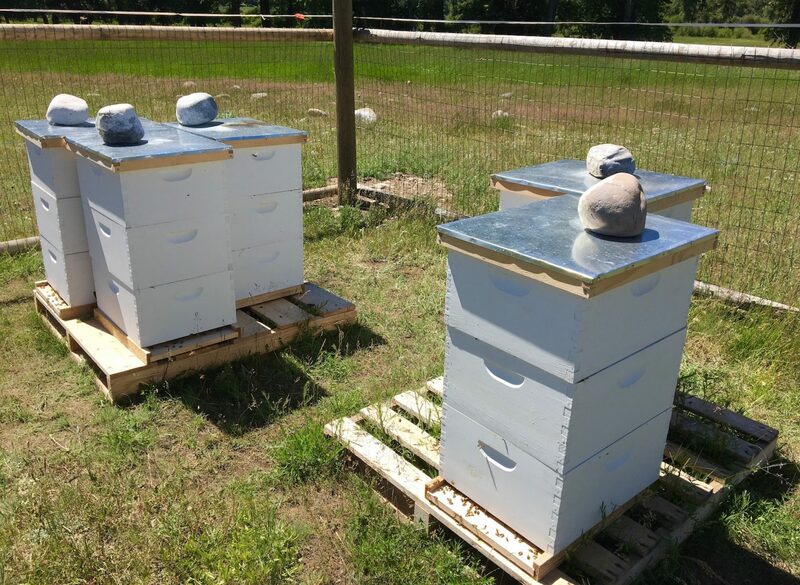 Our hives have come a long way since I first started to detail their journey to The Ranch on this blog. They have successfully built up their brood chamber to grow their ranks and the population has surged enough that they have enough honey to store for winter and there’s still plenty for us to collect for The Ranch. Honey being extracted from the frames. Photo by Kelsey Bruns. 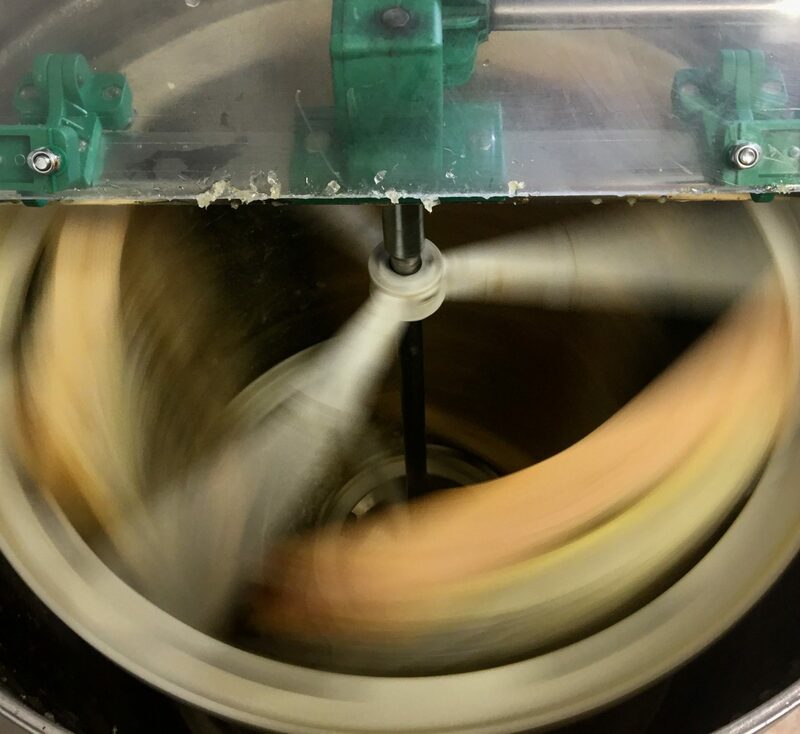 Honey is extracted from the frames with a centrifuge action machine. The frames are placed in the extractor, honey is forced out of the framed onto the side of the cylinder through the circular motion. Our first batch of Ranch honey! Photo by Kelsey Bruns. Our single batch this year is a lovely mix of clover and wildflowers that is light in color but full of flavor. This honey is completely unprocessed. It is raw, organic, and as local as you can get. 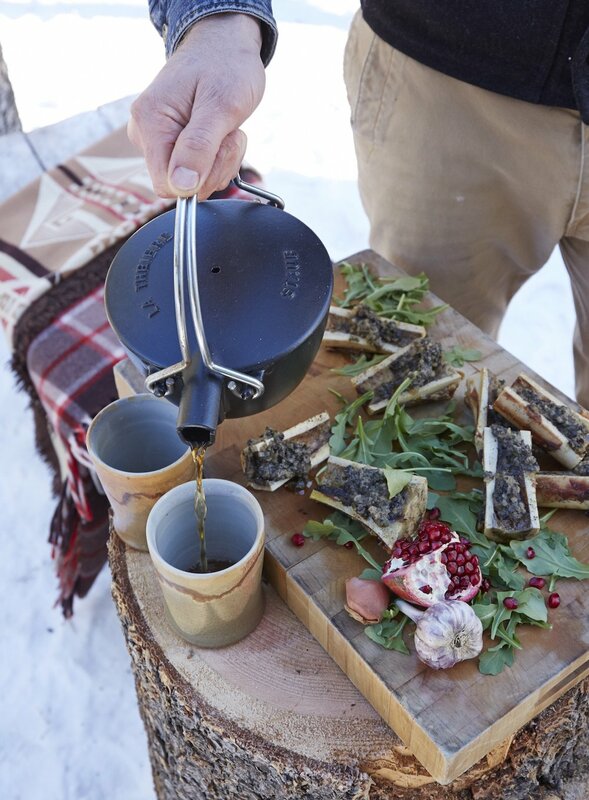 As part of our dining experience, our Ranch honey will be used in many of our ranch-inspired recipes and creations. 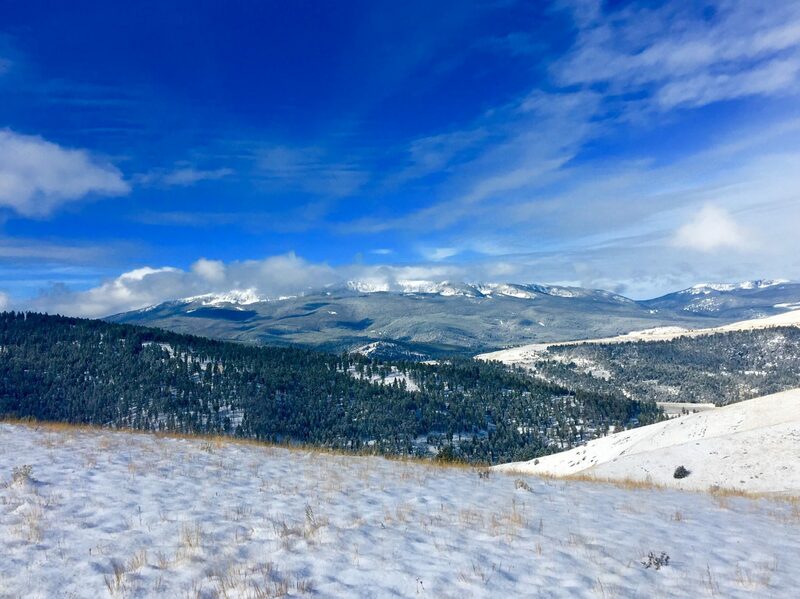 Montana winters are beautiful but they are also long and cold, especially for creatures such as the honeybee. The bees work with the seasons. As the days get shorter and cooler, the queen lays fewer and fewer eggs. This is incredibly intelligent. When the queen lays fewer eggs, the hive gets smaller in bee numbers and thus the hive consumes less honey. As a result, when the winter is longer than expected, the hive won’t have to ration their food stores. In addition to the queen’s work on winterizing the hive, I am taking additional steps to ensure the hive survives winter. The hives will be moved to the Bitterroot Valley, which is just west of us here in the Rock Creek Valley. Though only 60 miles as the crow flies, this valley has a much lower elevation, and thus, their winters are milder. Their spring arrives a little earlier than ours and will provide the hives with early spring food such as apple and cherry tree blossoms. Our Rock Creek autumns are filled with colorful changes in leaves and often snowy mornings. The bees will seek milder weather while we play in the powder! Photo by Kelsey Bruns. 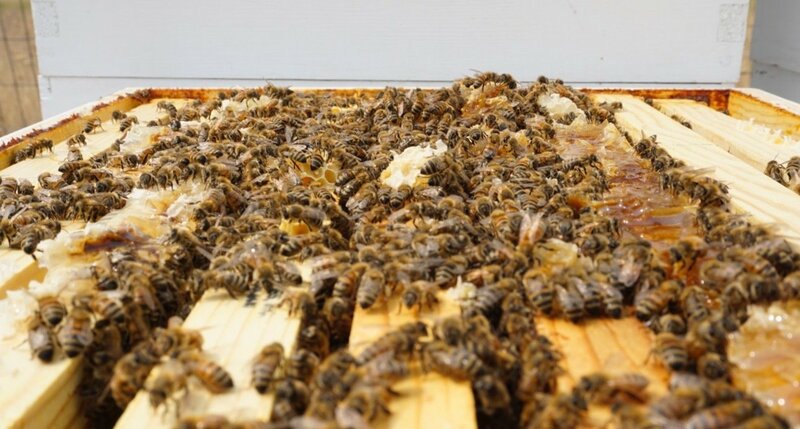 Once the hives are moved to the Bitterroot Valley, it won’t be until March that they will be opened for assessment of food stores, disease, and queen presence. In the coming months the bees will cluster together to stay warm in the hive, and partially hibernate like many for us here in Montana. Their placement in their temporary home will be strategically guarded from the elements. To help the bees conserve energy and heat, I have already made their entrance to the hive smaller. This will decrease the cold wind from coming into the hive and also save the hive from using extra energy and bees to guard the hive entrance from any intruder. I will then wrap the hives with thick black roofing paper. This paper will act like a thermal layer to keep out the cold but also absorb warmth from the sun. Hay bales will be place around the apiary to block cold winds and snow. 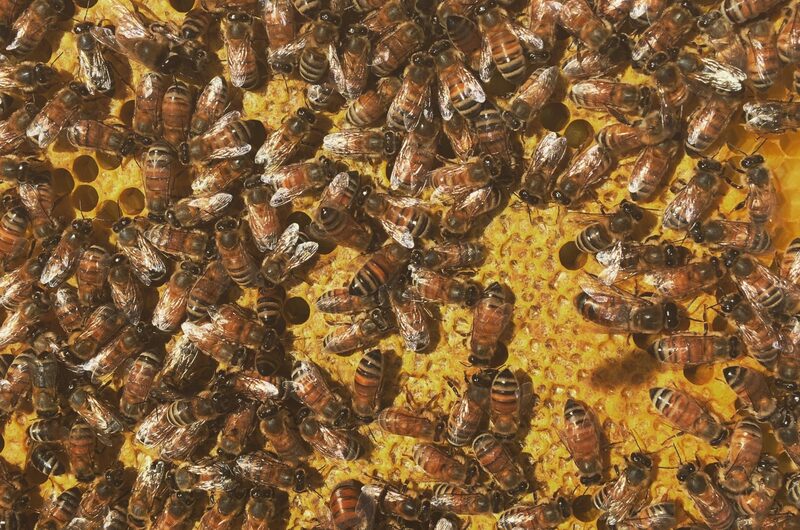 Being an apiarist means learning by experience as well as study. This is why I find beekeeping so enjoyable. The hive is different every day because it reacts to our ever-changing environment. Opening the hive each time is thrilling; it’s a chance to learn from an amazing super organism that is, to me, sheer perfection. Until next time! I’m looking forward to it. Honey is an amazingly diverse food that can enhance a dish or soothe symptoms of the common cold. It has been harvested and used for thousands of years, thus, working its way into cultural and medicinal practices worldwide. 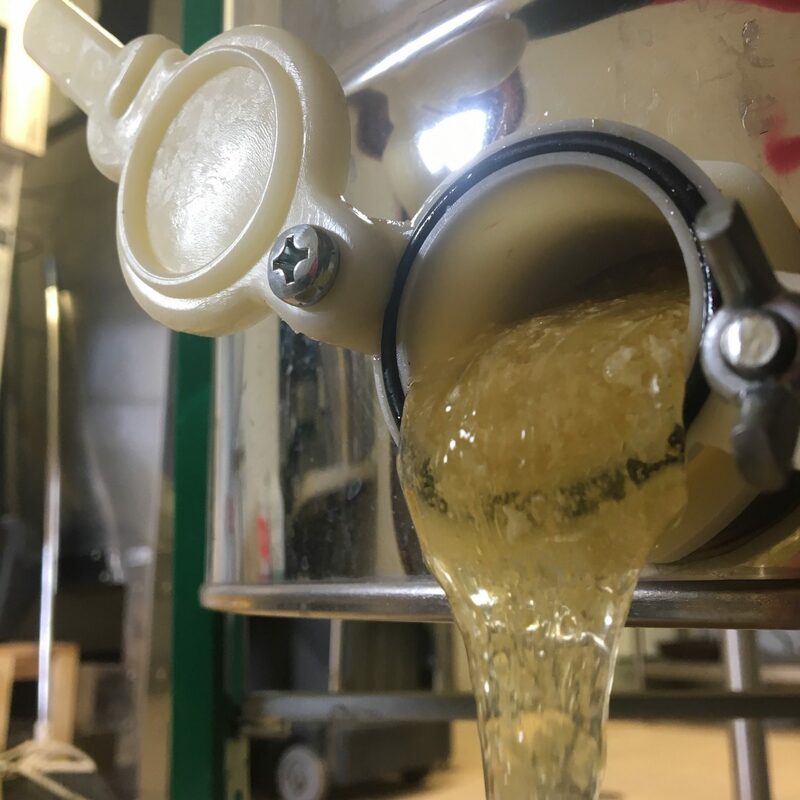 This year at The Ranch, we have been able to harvest 10 gallons of our very own honey that reflects our local ecosystem, and it’s going to make the farm-to-table culinary experience just a touch sweeter as we move into the winter months. 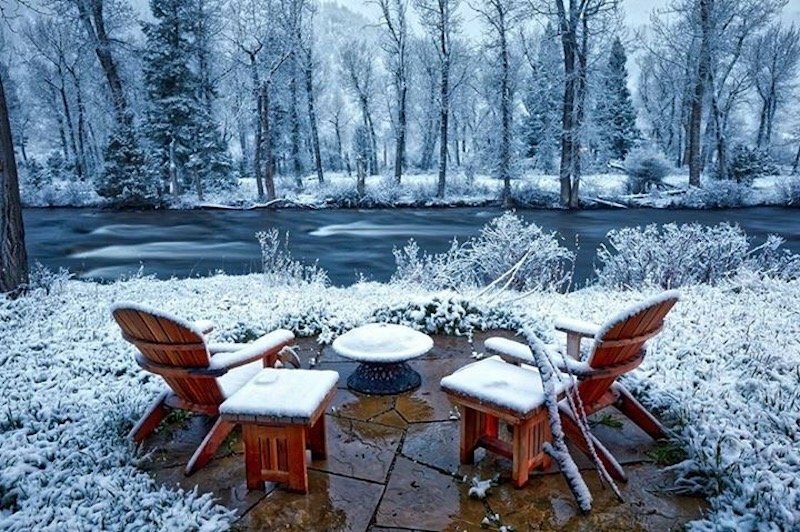 Photo of winter glamping on Rock Creek by Joey Wong of Kava Studios. At The Ranch, Executive Chef Josh Drage and his culinary team use an average of 25 gallons of honey per year! Though honey is often only thought of as a sweetener, this product is far more dynamic. Our culinary team uses honey as a seasoning and flavoring agent in everything from soups and sauces to marinades for our local meat products. Its floral and earthy flavor components can accent savory dishes in addition to sweet treats. Just like wine, honey takes on the flavors of its ecosystem. Honey can be sweet, musky, and malty — to name just a few tasting points. Those flavors can be emboldened by pairing them with certain ingredients. We look forward to using this flavor enhancer multiple ways in our ever changing seasonal Montana menus. As part of our winter seasonal offerings, our Bar Manager Ned Derosier is also incorporating our honey into the drink menus. 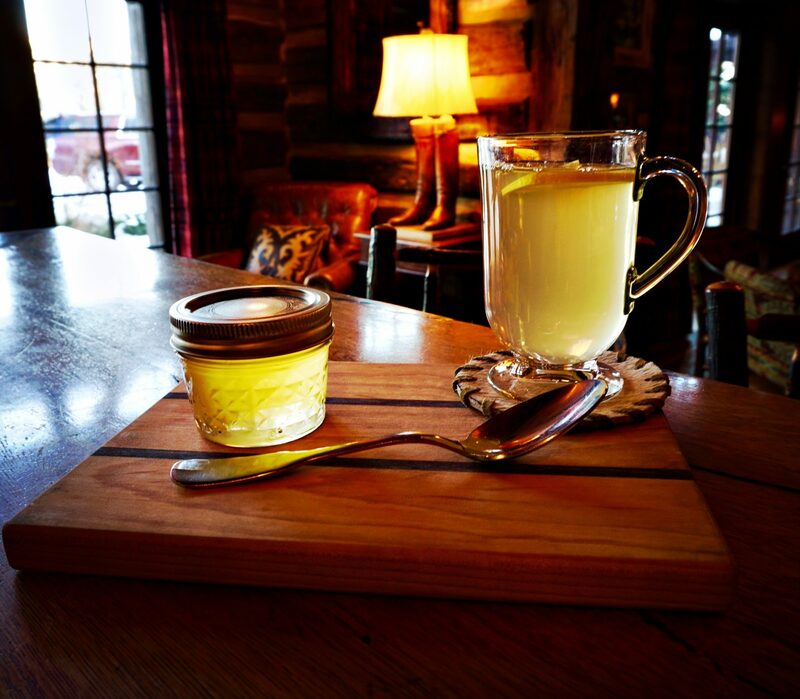 As the days are getting colder and the snow flies onto our valley floor, there is no better way to warm up than with our simple, but very special, Honey Harvest Hot Toddy! Pour in 1.5 oz. of whiskey into a toddy mug. Add in 1 oz. each of local honey and fresh-squeezed lemon juice. Top with 4 oz. of piping hot water. This drink will most definitely get you buzzing in a feel good way, especially with our Ranch at Rock Creek honey and Montana made whiskey! Cheers to the bees and to the festive season! 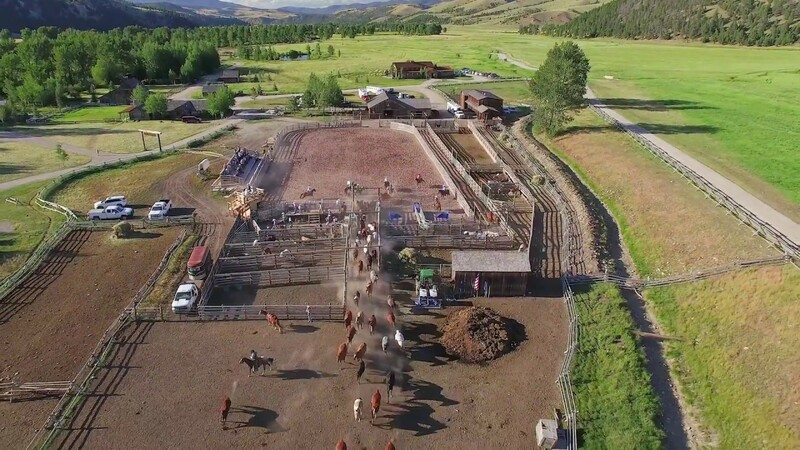 Read more about sustainability efforts at The Ranch.